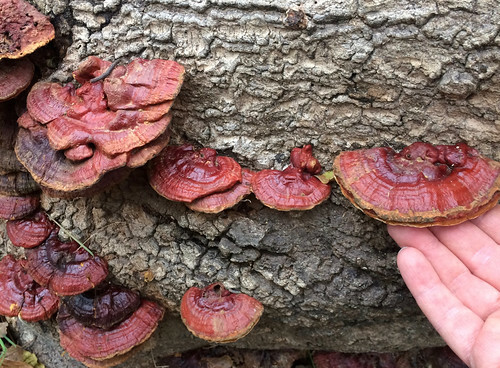 Reishi mushrooms growing from an oak. Reishi mushrooms growing on a fallen tree. Underside of the same mushroom shown above. Note it has pores instead of gills. Reishi mushrooms harvested from a dead root beneath the forest floor. These are just past the time to harvest and will not have much medicinal value. 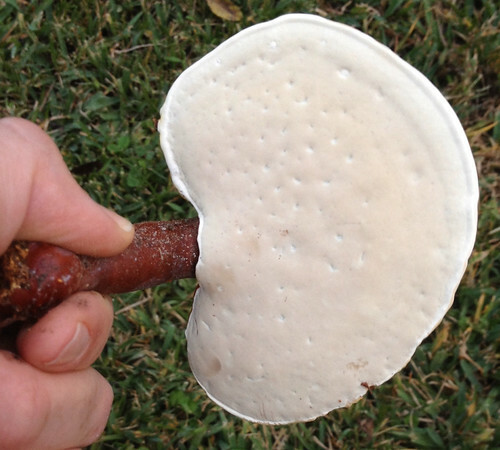 The lower, left-hand mushroom is upside down to show the bottom which has turned from white to yellowish. 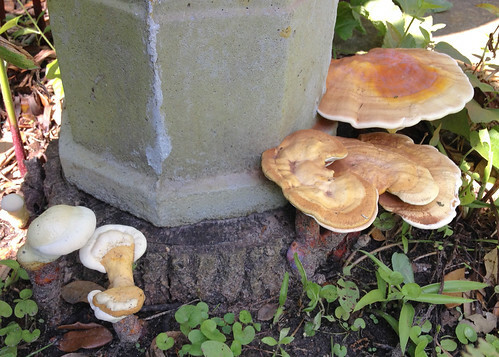 Young Reishi growing on an oak tree stump under a birdbath (March in Houston). Same Reishi in early April. Same Reishi in late April. Same Reishi in May. The beige powder everywhere is Reishi mushroom spores. 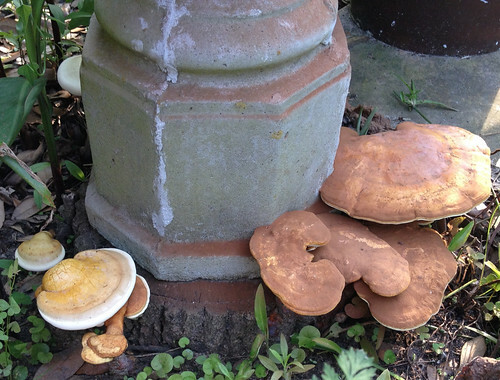 Same Reishi mushrooms in June. Reishi mushrooms abound throughout the wooded areas of Texas. Most commonly found growing at the base of dead pine tree stumps, they will also be seen poking up through the pine needles and wood duff of forest floors. 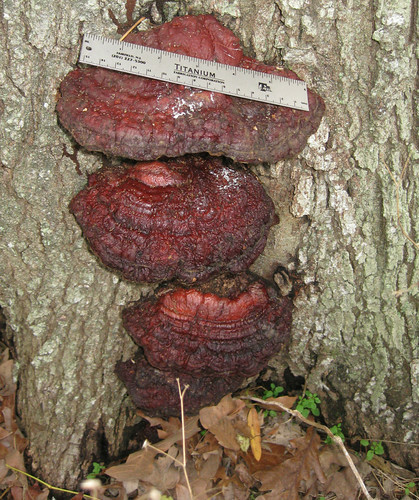 Dying hardwood trees such as oaks, sweetgums, elms and locusts are also common homes for these shiny, red mushrooms. Spores of Reishi are brown so make spore prints on white paper. These are hard, woody mushrooms. Originally from the tropics, look for them during hot weather though old, dry, unusable ones can be found all year long. Being polypores, these mushrooms do not have any gills on their underside. Instead, the bottom of fresh Reishi mushrooms will appear white and smooth, but upon closer inspection/magnification many tiny holes/pores will be seen. This mushroom, especially when growing from the forest floor, will often be kidney-shaped with the stem located at the center of the back/non-curved edge of the mushroom. When growing directly from a dead/dying tree Reishi mushrooms will grow flush off the tree bark and be fan shaped, usually with no stem. The topside of Reishi while be a shiny red, looking as if it were coated with a varnish, while the bottom will be white. There may occasionally be layers of red or white in between the top and bottom. 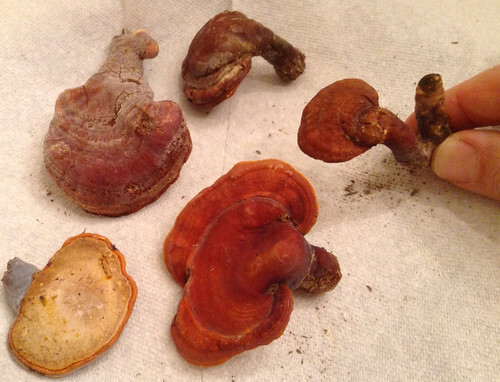 The stems, when present, will be the same red as the top of the Reishi. 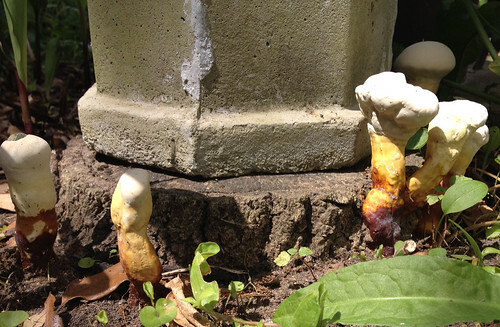 The medicinal benefits of this mushroom are almost legendary. It contains compounds that function as anti-virals, anti-tumor and anti-cancer, antibiotics, immune system stimulants, respiratory aids, antioxidants, anti-aging and more. The traditional method to consume these mushrooms is to grind dried Reishi into a fine powder which is then used to make a tea or added to coffee. Once dried, these mushrooms are very tough and hard to grind so a good mortar and pestle are needed or a very powerful coffee grinder. Another way to extract the medicinal properties of these mushrooms is by making an alcohol tincture. Shredded Reishi are soaked in 80-100 proof alcohol. Half-fill a jar with chopped/shredded Reishi then add enough alcohol to fill it twice as high as the Reishi. Tightly cap then vigorously shake the bottle. Shake it 1-2 times a day for six weeks then strain out any mushrooms solids. Place the filtered tincture in a colored, stoppered bottle and store in a cool, dark place. Traditionally, 3-5 drops of this tincture would be taken daily, though do not consider this medical advice. Often the alcohol-extracted mushroom material was then be boiled in water to extract any water-soluble medicinal molecules. Starting with twice as much water (by weight) as mushrooms, this was boiled down to half. The decoction was allowed to cool, solids were strained out, and then added to an equal amount of the alcohol tincture. This gave a solution that was over 40% alcohol which was enough to preserve it. The dosage of this solution was still 3-5 drops a day. A comprehensive review of the medicinal properties, including many scientific journal referneces, of Reishi mushrooms can found in MycoMedicinals. 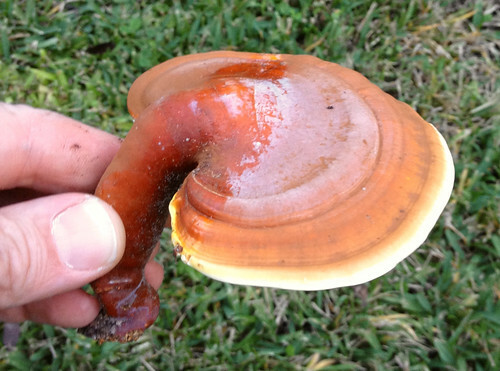 The only mimic to Reishi mushrooms are Red-Belted Brackets (Fomitopsis pinicola) which are native to Europe. 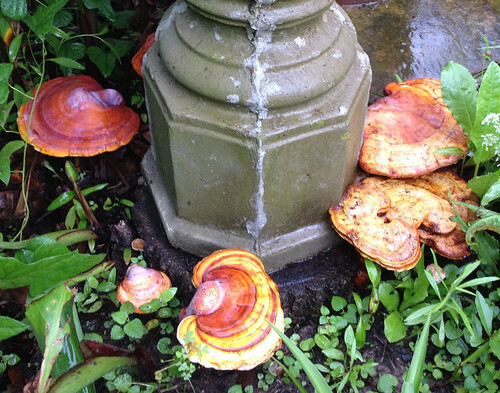 Being polypores, Red-Belted Brackets are non-toxic though care should always be used when trying a new mushroom. 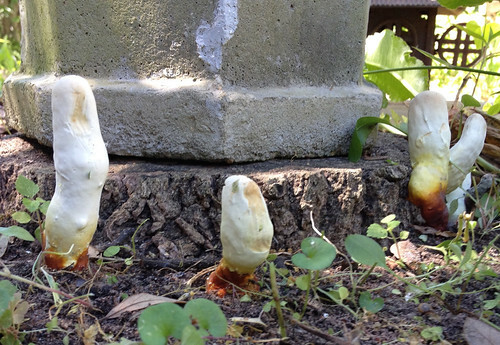 These mushrooms produce yellow spores and grow into thick, many-layered "conks".